↑ "Kuomintang Official Website". Kuomintang. สืบค้นเมื่อ 13 September 2011. ↑ Hsu, Stacy (16 January 2017). "Hung urges for scrutiny of KMT leader elections". Taipei Times. สืบค้นเมื่อ 16 January 2017. ↑ 政策綱領 (in จีน). 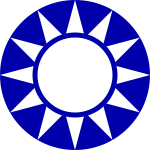 Kuomintang. สืบค้นเมื่อ 2016-06-19. ↑ The Editors of Encyclopædia Britannica. "Three Principles of the People". Encyclopædia Britannica. ↑ Mary C. Wright (1955). From Revolution to Restoration: The Transformation of Kuomintang Ideology. Association for Asian Studies. pp. 515–532. หน้านี้แก้ไขล่าสุดเมื่อวันที่ 16 เมษายน 2562 เวลา 09:22 น.